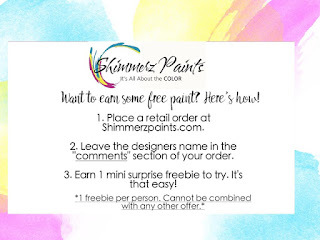 Sandi here with you today sharing my first Shimmerz Paint project for 2019! 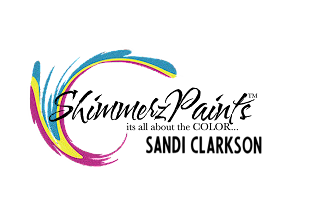 Here's hoping for a creative year for all of you!!! My first step after selecting my papers was to coat them with clear gesso and then added Paste-Eez Salt of the Earth texture paste pushed through a stencil. 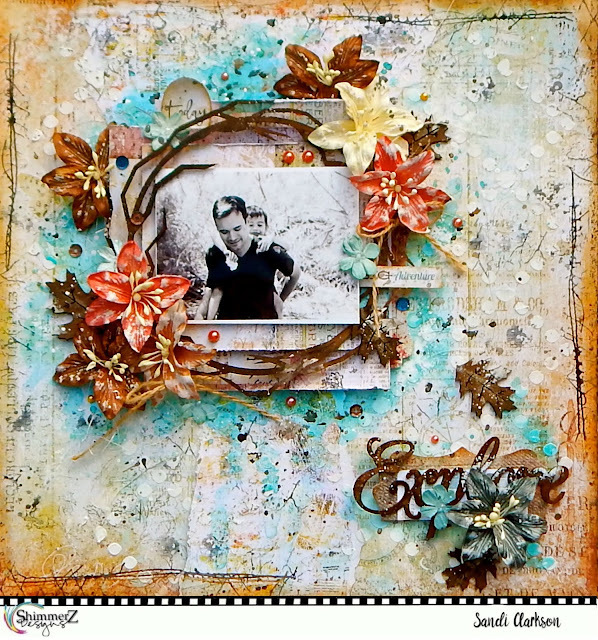 After that dried, I added my distressed photo layers along with the photo of my grandson. Before moving on, I did some random stamping. After choosing some chipboard embellishments from Creative Embellishments, I prepared them in a couple of different ways. This Twig frame with fall leaves was sprayed with my Shimmerz Coloringz Chocolate Brownie. After that dried, I sprayed the frame and leaves with my Shimmerz Vibez Hot Fudge which gave them a warm glow! Before adding my florals and other embellishments, I enhanced my focal area by painting on Coloringz Well Blue Me Down with a small brush. As I worked, I keep some water nearby so that I could dilute and let the color run as desired. The chipboard title piece is from Creative Embellishments Adventure Word Set. I decided to alter it a bit differently and chose my Inklingz Penny 4 Your Thoughts which turned out great! It gave it a nice, copper-y look. In the background, you can see the Paste-Eez Salt of the Earth which was pushed through a stencil. Here I tried to capture a better view of those copper tones of the Inklingz Penny 4 Your Thoughts. The leaves were treated with a smattering of Blingz Gold Glimmer along the vein lines. Finally, I added my florals and bling. Then splattered with gesso as well as Coloringz Night Moves which is black and the primary project color Coloringz Well Blue Me Down. Be sure to mention my name if you do a little retail shopping at Shimmerz for a little free paint.